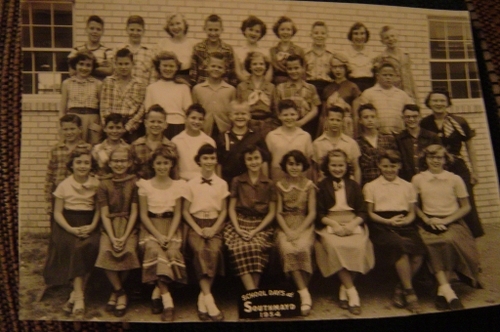 Mike Roberts also sent this photo of the 6th grade class he was in. Here are the names of the people we know for sure. Mike is certain that some of you ladies (sorry guys!) can fill in the blanks in our memories. How about it??? Row 1 L to R: Betty Bobb, ? , Linda Collins, Kay Burg, Sandra Barry, Melba Evans, Charlotte Vann, Fonda Whitt, ? Row 4 L to R: Alan ?, ? , Doris, ? , Nita Bolin, Sally Jo Boulware, ? , Lynn Chatfield, Bill ?